Take one full piece of KB Support Tape (10 in) and anchor it to the bottom of the ball of your foot (area right below your toes). 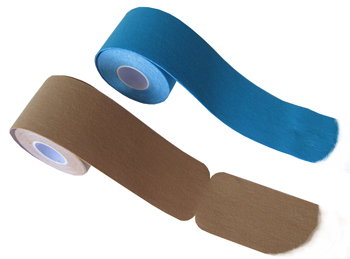 Using about 75% stretch, pull the Tape along the bottom of your foot and continue up the back of your heel and calf, rubbing the Tape in to ensure it sticks to your skin. 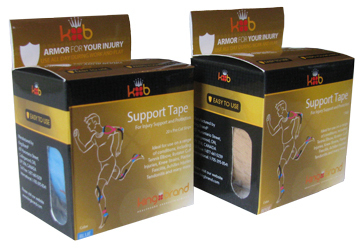 Take a half piece of KB Support Tape (5 in) and use 50% stretch to apply it horizontally across your Metatarsals on the bottom of your foot, rubbing the Tape in to ensure it sticks to your skin. Using another full piece of KB Support Tape, anchor it on the inside of your ankle, just above your ankle bone. 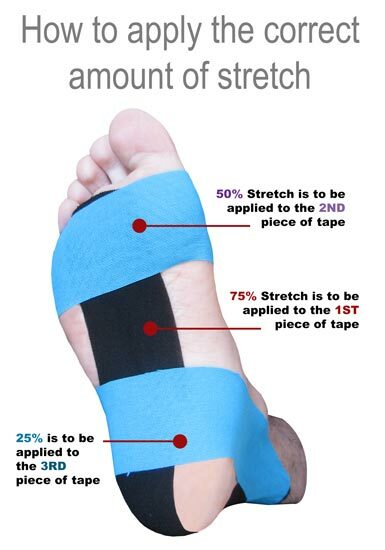 Using 25% stretch, pull it down the side of your ankle and around the bottom of your foot to the opposite ankle bone, rubbing the Tape in to ensure it sticks to your skin.